This dish is delicious and really easy to make. It’s not only easy, but also pretty fast to prepare. 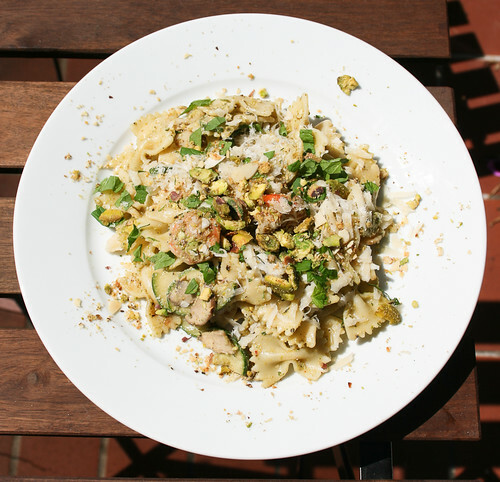 You can eat it as a cold pasta salad in the summer or as a hot main dish in the winter. This recipe is for six persons. First, we make the pesto. Take a pan. Roast the pistachios first and after a minute or two add the almonds. Put them in the mortar and pestle to grind them. If you’re in a hurry you can just put them in a blender or food processor together with the rocket salad, garlic, cream, basil, mint, cheese and mix it. Add olive oil and keep on blending. Add some fresh black pepper and salt, as you like. Clean the scampi’s, don’t forget to take out their intestines. You can also take chicken. Put pepper and salt on the scampi’s. Put some olive oil in the pan and heat it. When the olive oil is hot, put the scampi’s in the pan. Two minutes on one side, two minutes on the other side and put them aside. Cut the zucchini in small slices. Do the same with the mushrooms. Start to fry the zucchini untill they are soft from the inside. After a minute or two, add the mushrooms. Be careful, the zucchini has to be a little crunchy. Take a pan and boil enough water. With “enough” I mean at least 2 liters of water. In Italy they say: “pasta devo nuotare ” or “pasta needs to swim”. Add some salt. Put the farfalle in the water and let it cook until al dente. Don’t forget to pour some cold water over the farfalle, otherwise the pasta will stick together. Keep it warm. Mix the pesto with the vegetables and the pasta. Sing an Italian song. Add the scampi’s and put it in plates. Don’t forget to finish the plates with some black pepper, mint, cheese, crushed pistachios or almonds. Buon Appetito!